Planning the Ultimate Romantic Yellow and Gray Themed Wedding! Gray is the “it” color to accent your wedding color palate this season. It’s subtle, it’s classic, it’s the new black. And paired with yellow it creates a beautiful color palate perfect for wedding and reception. Romance brings to mind new love, blooms and buds, whimsy and excitement. Gray paired with yellow creates a classic, crisp and understated combination. Perfect for a lavish wedding. Vera Wang at affordable prices! What a great find for 2011. This gown features a silver toned crystal broach at the waist band that very subtly incorporates the gray color into the bridal gown. And I just love the details of this dress. The asymmetrical shoulder, the mermaid style skirt with swirling cascades of organza fabric, and beautiful crystal design on the waist band create a simply whimsical and romantic dress. This buttercup yellow bridesmaid dress is to die for! Why not mix it up with bridesmaids in both yellow and gray? Fresh make up, softly tousled up do and a perfect hair accessory! A floral headband is a simple way to finish your bridesmaid hair styles. And lets not forget the guys! The yellow shirts are great and could even be paired with a lighter gray, in keeping with our color scheme. And look at the socks! What a riot. And the converse, must be a guy thing, lol. Simple daffodils are a gorgeous contrast to a gray bridesmaid dress. And what an inexpensive way to create a beautiful yellow flower bouquet! Or for a more upscale look, this is a beautiful combination of yellow flowers. They simply pop against the gray backdrop of the bridesmaids dresses. What a gorgeous wedding program! A beautiful floral design printed in black ink on light grey linen stock paper. Visit www.theclassicinvitation.com for more information. 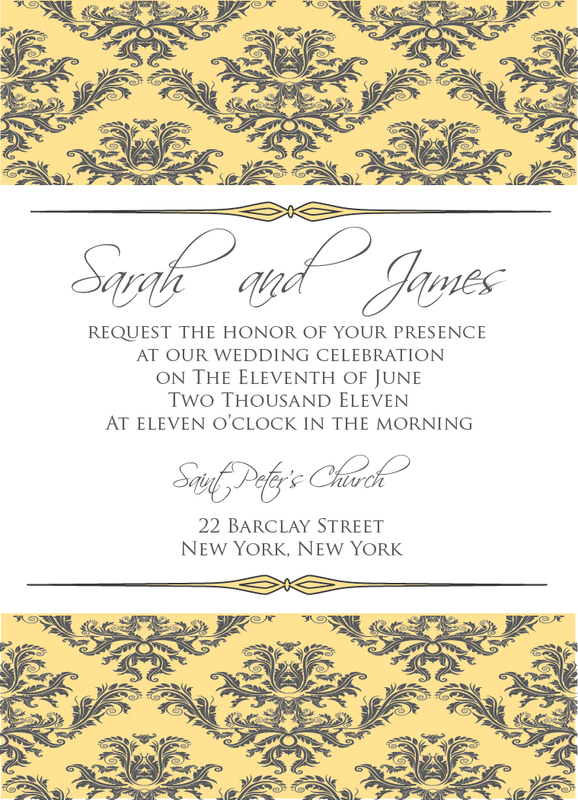 Beautiful Yellow and Gray wedding invitation. And customizable in any shade of yellow and gray (or any color scheme for that matter)! Visit www.theclassicinvitation.com to place an order. Could this be any more romantic? The gray and yellow details are just perfect. Though depending on your wedding date and location this idea may not be practical for your wedding, but the furniture and design could transfer easily to an indoor venue and look just as lovely. On a tighter budget? Simplistic elegance gives you a lot of bang for your buck. I think that a good dollar store hunt would turn up many of the items on the table featured in the picture above. A beautiful gray and yellow monogram would be a great addition to your invitations, programs, dance floor, table number cards, et cetera. It’s a simple way to get more bang for your buck. And for only $10.00 you can order a pre-designed monogram that you can use for all of the above and more! Visit http://theclassicinvitation.com/monograms.aspx to order today! This entry was posted on Tuesday, February 22nd, 2011 at 9:38 pm	and tagged with gray and yellow theme wedding, gray and yellow wedding inspiration, gray floral wedding programs, gray wedding programs, plannning the ultimate romantic gray and yellow wedding, romantic gray and yellow theme wedding, weddings and posted in Gray and yellow theme wedding, Wedding, wedding stationery, weddings. You can follow any responses to this entry through the RSS 2.0 feed. « Simply lovely Wedding Table Number Card!